My own design using Brush Box and Gum Tree branches I’ve been working on this for a while and on my recent trip to the farm managed to finish it off. 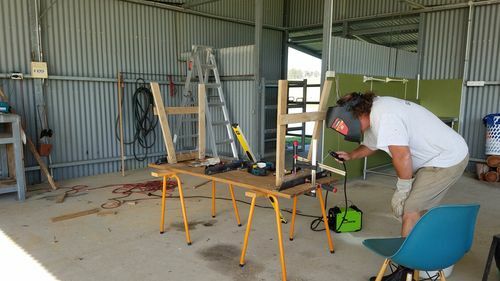 I wanted a farm table for the shed for people to sit around, it had to be durable to last, I wanted to make it look rustic and authentic. 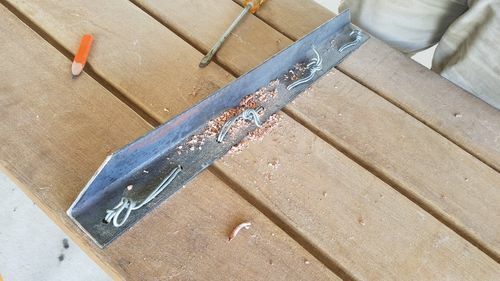 I figured rough sawn Australian Hardwood was definitely the go, I figured I,d use wire as much as I could to fix it all together and give it some appeal. All timber was rustically finished with 80 grit disk sander and coated with decking oil. Definitely one of my favorite design and builds. 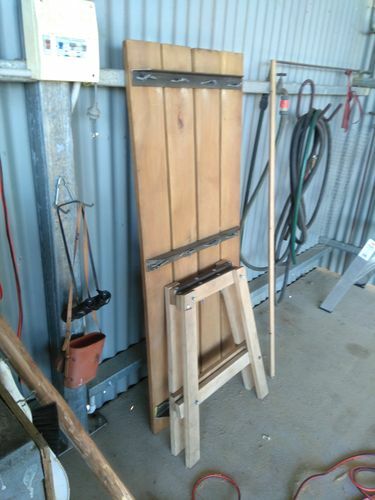 These cobb and co hitches where used extensively on Australian farms in the early days mainly to build stock proof fences and timber stock yards. Nice design for a great looking rustic table. Thank you Swirt, always nice to get your comments. using the angle iron worked well as I could then weld the table top to the A frame legs which I bolted angle to. It came together nice and strong. It takes two to lift it though. Definitely not as fine and intricate as most of your works, its all wood though. We always called that wrapped wire a “wire hitch” great on fencing. 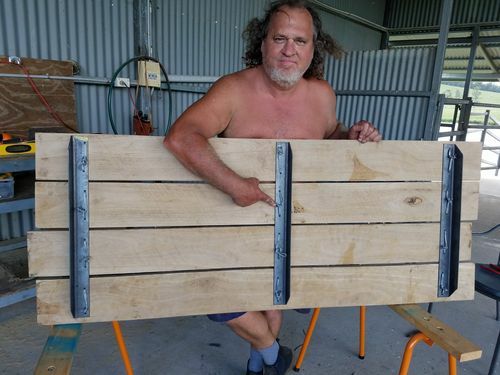 I have to say I never thought of it on a table, but I do know it to be a strong, somewhat flexible joint, so wood movement will never mess with it. Good thinking out of the box, it looks sound enough to offer years of service, and among woodworkers will always be a conversation piece. The use of the wire is so creative, and seems to me to be very effective as well as providing great aesthetic details. 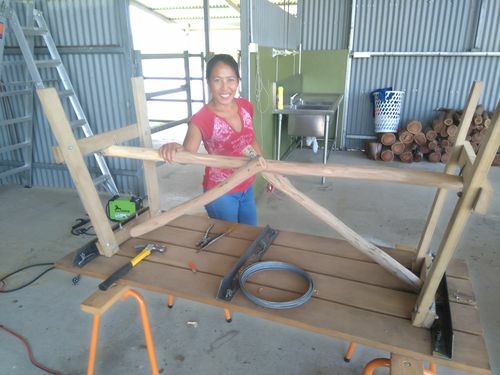 I am also impressed with being able to find those straight limbs to make the under carriage supports – very, very nice! Thank you for the comments, and interesting to know that these wire hitches are used in the US also. 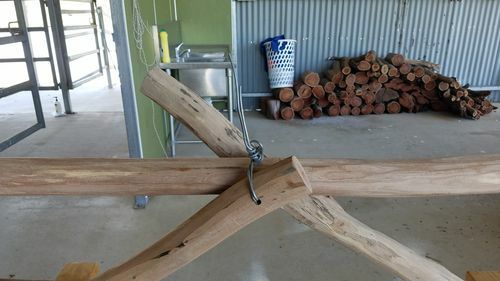 Thanks very much for the comments Jimi, and yes the 2 inch type limbs for the undercarriage where from fallen branches that I picked up from the paddock, I simply stripped the bark and sap wood off then gave them a sand using 80 grit 9inch disk sander. Managed to get them off the ground before the ants or rot got to them. Anthm27 , nice job and congratulations on your ‘Daily Top 3’ award. Anthm27 , nice job and congratulations on your Daily Top 3 award.